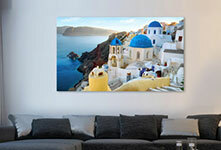 Metal prints on Alu-Dibond - TOP quality - 100% FREE Shipping! Next day delivery only available if ordered before midday. 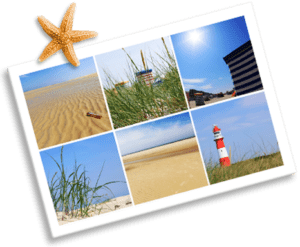 Aluminium is by far the least well-known medium for image printing in private photo printing use. However, metallic print lacks nothing that other photo products such as canvas, acrylic glass or posters can offer. Quite the opposite, in fact: Alu-Dibond has certain qualities that make it unique and perfect for printing in large format. This is one reason why many photo exhibitions rely on this material and photo experts like to work with this product, especially when it comes to oversized prints. Alu-Dibond consists of two thin aluminium sheets which are held together in the middle by a plastic polyethylene core. Since both materials are very light, the end product is also a light yet dimensionally stable photographic print. 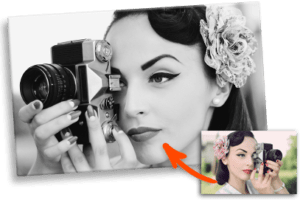 Since we print the photo directly on to the aluminium rather than sticking it on, you will receive a 3 mm thick, extremely stable premium photo product. 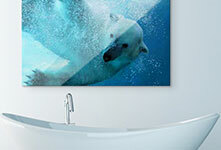 The product is waterproof and temperature resistant, making it the ideal photo print for hanging in the bathroom. Alu-Dibond is also a sought-after medium for outdoors or for a backsplash in the kitchen. What relevance does the white or brushed finish have? Colours appear particularly brilliant when they are printed using UV direct printing processes on to metal. The difference between semi-matte, white Alu-Dibond or the brushed variant in the surface finish. A semi-matte finish presents the original colours of your photo with excellent colour resolution and brilliance. A brushed finish allows your Alu-Dibond to appear fine and resplendently metallic, and gives your metal print a unique structure. For this reason, a matte finish is better suited to bright rooms with lots of light reflections. The aluminium photo print is, however, sometimes a little cheaper. 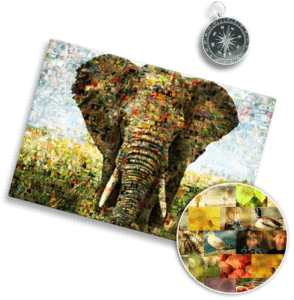 Thanks to their unique properties, aluminium photo prints are readily used in the advertising or trade show industry and by exhibitors. But it is also the ideal photo product for private individuals. In addition to its feather-like weight, it also convinces with its detail and image sharpness. This makes the picture easy to hang and also easy to transport in the case of moving house. Alu-Dibond is ideal for the creation of collages and spectacular motifs for your living space. 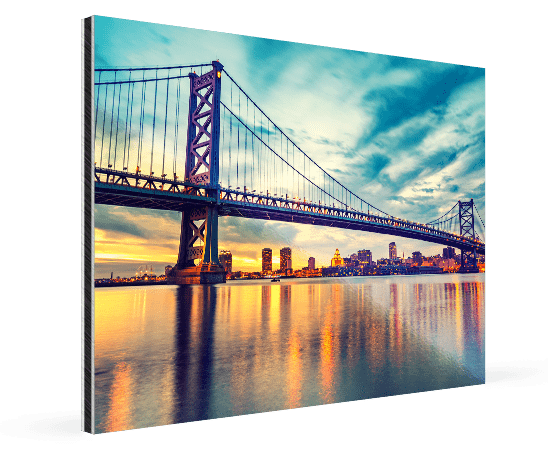 With us, you can very simply order your own custom metal print. 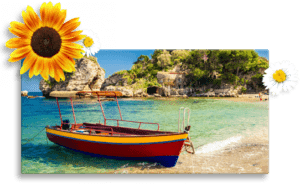 We can cut your photo on Alu-Dibond to the millimetre. 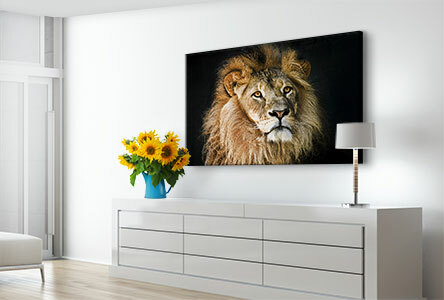 In addition to our standard sizes, you can have your aluminium photo print manufactured in your preferred size, so that it harmonises perfectly with your interior design. Whether panorama, portrait or square format, we’ll help you find the right size for you. Simply write to us with your inquiry at contact and we’ll get back to you without delay. Alu-Dibond is certainly one of the more exclusive media for photos and the materials used are correspondingly high quality and expensive. 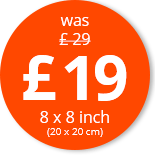 Nevertheless, we regularly have special offers allowing you to order particular sizes at great value prices. 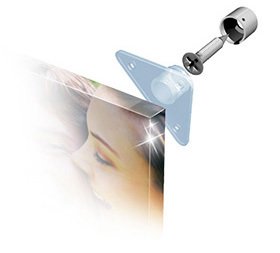 Ghost: A four-piece mounting set that is applied to the back of your aluminium photo and which therefore gives the impression that your picture is floating freely in front of the wall. It has a load-bearing capacity of up to about 600 grams. Couple: The Couple system is somewhat stronger than Ghost. 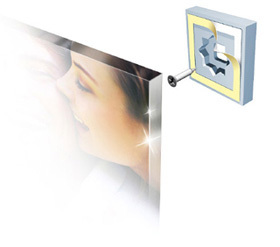 This will also be installed invisibly behind your photo on Alu-Dibond and can securely hold pictures of up to 6 kg in weight with a small clearance to the wall. 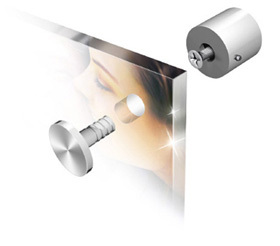 Steel20: Using this system, your metal print will be attached to the wall in a stainless steel look. The set is delivered complete with screws and holes and will hold all aluminium sizes.